Vaturanga or Vaturana or Ndi is a dialect of Ghari, a major language spoken on the west of Guadalcanal island around the capital, Honiara, in the Anglican Church of Melanesia. In light of this language’s intelligibility outside of its group of first-language speakers, Vaturanga has been used for a large number of liturgical and religious translations for use on Guadalcanal. Linguist-priest Arthur Capell described it as a “mission/ecclesiastical language” that could be used across normal linguistic or ethnic divisions, in much the same way as the Mota language was used by the Melanesian Mission as a lingua franca until the 1930s. In fact, the Ghari language generally was used in this way by the Roman Catholic Church. The first liturgical translation into Vaturanga was published in 1902 by Percy Temple Williams (1866-1933), a member of one of New Zealand’s most prominent missionary families. This was followed by regular revisions and expansions: 1912 (Prayer Book); 1922 (Prayers and Hymns); 1935 (Communion Manual); 1939 (revised Prayer Book); 1944 (Prayer Book); and the current text. Revised liturgies were later published in 1963 and 1971. Another important title in the bibliography of Anglican publications in and about this language is missionary-linguist Walter George Ivens’ Grammar of the Language of Vaturanga, Guadalcanal, British Solomon Islands (1934). The BCP text given here, published in 1950, is listed as No. 189:5 in David Griffiths’ Bibliography of the Book of Common Prayer. The service of Holy Communion in this book is a fairly straightforward translation from the 1938 Melanesian Book of Common Prayer, but the other services appear to be original to this book or come from some other source. The Preparation for Holy Communion is somewhat similar to that in the Raga text of Holy Communion. We also have a Preparation for priest and servers at Holy Communion, which was issued separately in 1953. 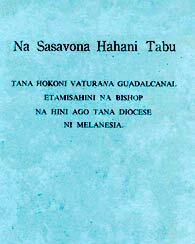 The other text presented here is a 1971 translation of A Liturgy for Melanesia, which superseded the above 1950 Holy Communion translation. Thanks are due to Richard Mammana, who transcribed the texts, to Thomas Rae, who provided the 48-page BCP text, and to Bp. Terry Brown, who provided the other texts.